Hey guys! Happy Friday! 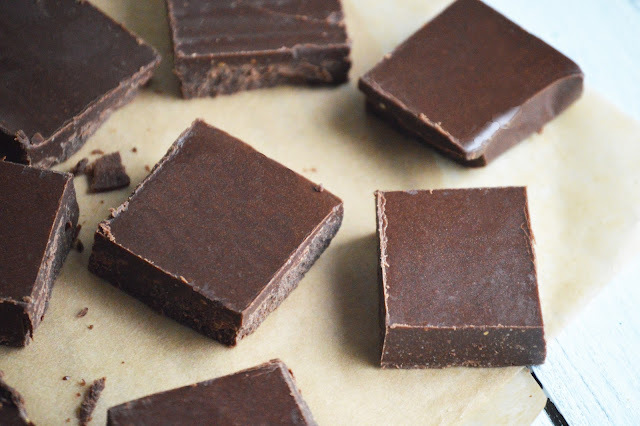 I have been working on a Paleo fudge for a long time that actually tastes fudge-y. This one takes the cake. It is SO super simple and it's so super hard to only eat one... But go ahead, have 2, or 3.. I used cocoa powder and Shakeology in this recipe. If you're interested in ordering Shakeology and working with me as a Nutritionist for free with your order, click here! While Shakeology isn't technically fully paleo, I recommend it for most of my clients. It contains vitamins, superfoods, greens, healing herbs, probiotics. and digestive enzymes. It has healed my autoimmune symptoms over the past year, and I have seen it do amazing things for people's heath! Be sure to email me at here with any questions you may have! This recipe only takes 5 minutes to prep, and 20-30 minutes of sitting in a freezer-so your delicious chocolate treat will be ready in no time! 1. Melt coconut oil in the microwave, let sit so oil is not scorching, a little above room temperature. 2. In a high speed blender, blend all ingredients. 3. Pour into an 8x8" parchment-lined pan and freeze for 20-30 minutes until set! Store in the fridge.